New Level Up Village courses include Global Water Crisis, Global Game Strategists, Global Video Game Designers (6-8), Global Doctors DNA (6-8) and two more levels for our Global Langauge Lab program. Nearly one billion people on our planet lack access to clean water, and even more our running out. Have you ever thought about where water comes from or how much water is available for humans on Earth? In this course, students will reflect on their own water use and how they can be a part of the solution to the global water crisis. They will even learn how to create 3D designs to help solve this global problem! In rural Kenya, a student who takes Level Up Village courses through Kenya Connect collects water to bring back to her home. In Level Up Village’s new Global Water Crisis course, students will reflect on their own water use and that of their global partners. Together, they will brainstorm possible solutions to water access issues and apply CAD & 3D printing to the problem. Global Game Strategists (Grades 3-5). Together with their global partners, students embark on an educational, dice-based adventure game about protecting the planet’s trees. With action and adventure similar to Pokemon Go! or Dungeons & Dragons, they will engage in innovative gameplay that strengthens math skills, develops new problem solving skills and encourages teamwork. In response to demand, we’ve added a new level of Global Video Game Designers. Designed for middle school students, this course teaches students to code video games, create animations and remix what others have done. They use the engineering design process as they collaborate with a global partner student and their classmates to solve a design challenge. 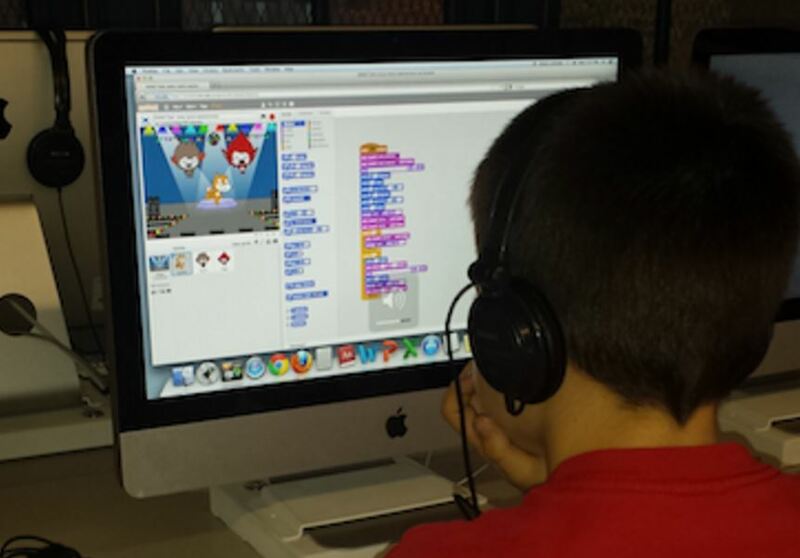 Students use a programming language called “Scratch” to learn a variety of coding and programming skills, culminating in a co-designed video game: a global theme park game that incorporates elements of each culture. In our new Global Video Game Designers for 6th-8th grade, students collaborate one-on-one with a global partner on a design challenge and co-create a final video game: a global theme park with elements of each partner’s culture. Global Doctors DNA is now available at the middle school level, as well. Students in this course explore whether the environment or DNA determines who we are as individuals and how we live our lives. They work together with Global Partners to learn about genetics and epigenetics while discovering how environmental and social conditions around the world can influence those things for better or worse. Activities include making Punnett squares, building molecular models and delving into case studies of genetic traits and mutations. We’ve also added intermediate and advanced levels to Global Language Lab. This course provides an innovative way to further the development of foreign language skills by connecting U.S. students with native speakers in a global partner classroom. Students participate in a guided video letter exchange to practice their foreign language skills by engaging in meaningful conversation with their global partners. More information on the content of the beginner, intermediate and advanced levels can be found here. In addition to these great new courses, we also have many more exciting options available right now such as Global Web Designers, Global Explorers and Global Inventors (3D printing). To schedule a call or to receive more information, please fill out our contact form. A social enterprise based in Old Greenwich, Conn., Level Up Village (LUV) delivers pioneering Global STEAM (STEM + Arts) enrichment courses that promote design thinking and one-to-one collaboration on real-world problems between K-9 students in the U.S. and partner students in developing countries. Launched in 2012, LUV runs courses during school, after-school and in the summer at more than 150 U.S. schools, with 30+ Global Partner organizations in more than 20 countries. For more information, visit us at levelupvillage.com or find us on Facebook, Instagram, LinkedIn and Twitter @LevelUpVillage.